This question dominates the McCree side of the Construction Conversation. When you are served well and realize true value from your project on your terms, then your satisfaction grows and that grows our business. The proof is that 75% of our construction volume is consistently returning customers. Our promise to you of “Designed & Built Right” lives in our organizational DNA. Since our founding in 1926, the 4Rs of Relationship, Reputation, Referrals and Recommendations are our key customer satisfaction measures. The McCree business approach, structure, systems and decision-making process are the foundation for this commitment to serve well and often. We will deliver. We stand behind it. No doubts about that. Your project will be on-time and on-budget with quiet confidence. Here’s why: McCree is Central Florida’s only general contractor, architectural and engineering team with eleven essential trades under one common ownership. In addition, we have many trades under our roof. Integration across design and building creates internal fluidity and constancy of professional collaboration. Excelling in our unique business arrangement brings remarkable continuity in communications plus time and money savings. You’ll realize extraordinary value because you’re getting a better result for approximately the same cost as any other contractor. In short, your construction dollar is going further and you gain a smoother construction experience. 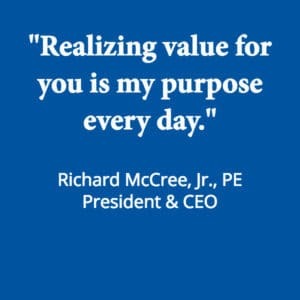 Once you experience the McCree CARES customer service and ProCore project management system, you’ll say to yourself, “I made the right decision.” This kind of peace of mind from concept to completion and beyond has positive implications for us personally, professionally and organizationally. Through ProCore, you see what we see. Every element and communication regarding your project is transparently online for your review at any time. Be as involved as you want, or just delegate it to us and be done. Got questions? Your Project Manager and Concierge are a text or phone call away. Construction Conversations continue throughout your project with the goal to deliver to you an incomparable level of comfort and personal satisfaction with your selection of McCree. Our kind of care, from inspiration to investment to installation, is the basis for beginnings that last beyond today.